Maneuverable, Visible, Predictable (& Communicative). One of the key elements of being safe on the road is having the right attitude. Adopt one of cooperation, while being prepared for others to make errors—they will. Riding in a manner that allows us to compensate for these lapses will make us much safer on the road. An acronym common in cycling education is MVP (some programs also add in a ‘C’). We know this stands for ‘Most Valuable Player’, but for our purposes here, we’ll use it to remember the following qualities we want to have while we’re on the road: Maneuverable, Visible, Predictable, and Communicative. Create a ‘safety zone’ for yourself. Ride so that you have space to get around obstacles, or to avoid them altogether. A good rule of thumb is to ride about a yard/metre from the curb *. This allows you to avoid drain grates, glass, gravel, leaf piles and other roadside hazards. If you do need to swerve around something on the road, you now have the option of riding towards the curb instead of out into traffic. You’ve also given yourself an escape route if another road user encroaches on your space. Note: for passing parked cars, one needs to be at least a door width and a bit away—generally about one and a half yards/metres. A good rule of thumb for this is to not get closer than a foot from being able to touch the side view mirror of any vehicle you are passing. * Most state/provincial legislation includes words to the effect that we are to ride as ‘near as practicable to the right side of the highway’. 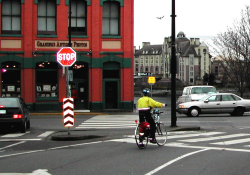 A considerable body of case law has established that a cyclist is permitted to ride far enough away from the curb to ensure his or her safety. Make sure you’re seen by everyone around you—from ahead as well as from behind. Riding a yard/metre out from the curb helps greatly in this. As well, wear bright colors, and use good lights approaching dusk, at night, and in low-light conditions. As much as possible, ride in a straight line so that others on the road know where you’re heading. Weaving makes you less predictable, distracts others unnecessarily, and puts you at greater risk. Based on a quick look at what we’re doing, other road users should be able to determine what we’ll be doing in the next five seconds, or longer. We are not in isolation on the road—we need to work in conjunction with other road users. Use all the tools you have to communicate with others around you. Placing yourself in a visible position on the roadway, scanning for traffic, signaling, making eye contact, using your voice or a bell where appropriate, and making you and your bike visible by means of bright colors and reflective material all help ensure that you are noticed by other road users. Applying these techniques properly and safely takes training and attention. These techniques are provided for information only and are not intended as a how-to guide.